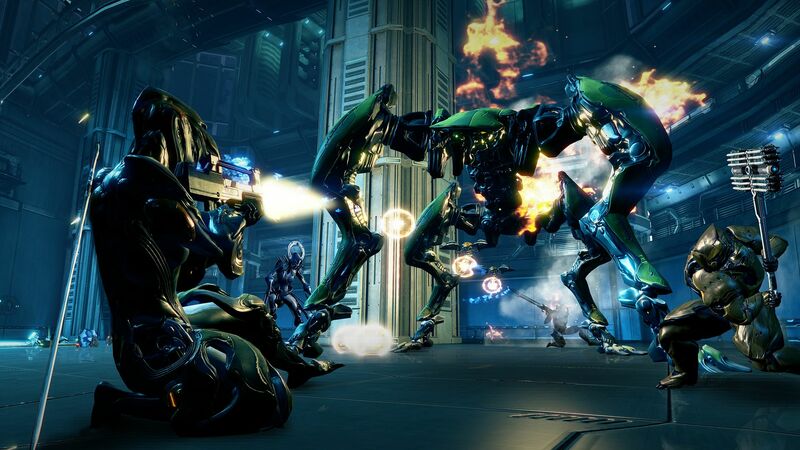 Last week I played, among other things, a third-person MMO shooter called Warframe. It’s been out almost a year on PC and was released as a launch title for the Playstation 4 just last November, so it’s not necessarily a new game, but one that’s been hovering on the edge of my periphery for a while. Having toyed with it for a couple of hours, I gave some preliminary thoughts here on the site (along with some talk of the bitchenest dating show/murder gauntlet on TV, If You Are The One), and those thoughts were noticeably lukewarm. The truth is, Warframe didn’t grab me at first. I believe I used terms like “bland” and “generic” to describe its game modes, and made mention of its relatively unspectacular environments. But I also mentioned that it seemed like one of those games that creeps up on you, due to the wealth of additional content that’s added monthly by the game’s developer, Digital Extremes. 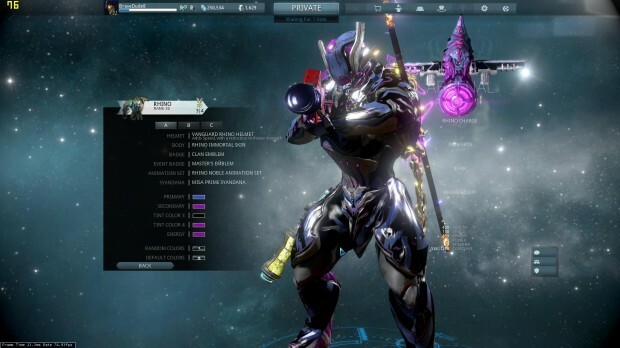 And sure enough, something kept tugging me deeper and deeper into Warframe’s combat, crafting and customisation options; I maxed out my starter Warframe and built myself another, as well as all manner of rifles, pistols, samurai swords, shurikens, shotguns and bo staves. This afternoon, I received an in-game achievement for having spent a hundred hours in matches – a hundred hours! In a week! It hardly seems possible. So, I feel it’s only fair that I revisit my initial remarks on this crafty co-op title and provide a more detailed review, one that gives it greater credit for its evidently addictive gameplay. Bear in mind that the game really is altered, refined and expanded considerably with each update, so anything I write here is reflective of its current state only. Incinerate your enemies with Ember! Chill them to the bone with Frost! And, uh… Scream at them very loudly with Banshee! In Warframe, you play a gunslinging space ninja in a mechanical suit – a Warframe, if you will. That alone should have alerted me to the simmering awesomeness of this game, but I’m a cynic at heart, so I needed to really be a space ninja for some time to truly appreciate the experience. 1. Your main firearm. This may be the usual shooter kit – machine gun/sniper rifle/shotgun/etc – or it may be a tech bow, flamethrower, shrapnel launcher, toxic acid projector, industrial laser or whatever other exotic armament floats your proverbial boat. I’m very much a classicist, so I most often carry an automatic rifle. 2. Your sidearm. Again, you could go with something traditional like a pistol or revolver, but why not give your space cowboy a touch of the Orient with some shuriken or throwing knives? Otherwise, how about a miniature shotgun? Laser-guided crossbow? Mix it up, a change is as good as a holiday they say. 3. Your melee weapon. This is where the magic happens. Samurai sword, two samurai swords, broadsword, kamas, hatchets, dual-edged axe, morning star, bladed bo staff, electrified bo staff, taser whip, glaive, pummelling gauntlets, knuckle dusters or some good ol’ commando knives. Because you should always do someone the courtesy of killing them to their face. And the final weapon, of course, is you. Your Warframe, depending on its model, comes with all sorts of goodies for causing havoc, so selecting one to purchase or build can be a tricky decision. Ember incinerates her enemies with fire, Nyx turns them against each other with mind control, Vauban uses stasis traps and grenades to lock them down – there are at least a dozen more in the mix, with new Warframes being released every few months. Personally, my favourite so far is Mag, who creates intense magnetic fields; she can hurl a dozen foes across the room with a flick of her wrist, or quite literally magnetise their bones so that their skeletons violently implode. She’s a classy lady. Here’s another, Saryn. If you’re a fan of lethal necrotic poisons, big hips and 80s shoulder pads, she’s your gal. Though the game could be described as an MMO, it’s match-based rather than set in a persistent world. After a brief tutorial you are introduced to a map of the solar system, with all the levels scattered across various planets and moons – completing each planet unlocks others of increasing difficulty. The first world, admittedly, has you running through a series of dingy, nondescript corridors, hence my initial verdict of “not a pretty game”, but subsequent worlds introduce a respectable diversity of environments, arid deserts and ice cliffs and so on. The later planets become insanely difficult for a single player, even having modded your equipment with better defence and firepower. Thankfully, there’s a seamless matching system in effect at all times (unless you specify otherwise), where anyone selecting the same level as you will be dropped into your game. You can also invite friends or people from your clan (your guild) if you’re in one. If you don’t want your gear to plateau, finding yourself a clan or some gaming buddies isn’t a bad idea. All the levels feature one of about a dozen match types, though some a more engaging than others. Exterminate, for example, quite simply tasks you with destroying every enemy in the level, without any sort of time limit. Deception and Spy have you sneaking in (or, failing that, kicking the door down) and hacking the enemy’s terminal to obtain information. Sabotage has you blowing up their reactor, which generally causes more of a commotion, and Capture and Rescue have you intercepting an enemy hostage or retrieving your own respectively. Screw your futuristic weaponry, a hammer is how you take care of business. To say these modes are easier in a group is an outrageous understatement. If you’re matched with veteran players, expect to run along in their wake while they demolish all opposition without breaking stride. That, I suppose, has been my biggest frustration with the game’s matchmaking so far: there’s an enormous divide between newer players and those with the very finest Warframes and weapons, one struggling to keep up with the other. Most people I was grouped with had no interest in looting or checking their surroundings, but attempted to break the land speed record while ploughing through to the exit. That’ll be me one day, I suppose, and then it’ll be someone else’s turn to complain. To prevent things from getting stale, though, the levels are all randomly generated from a host of set pieces; you may recognise the individual rooms and spaces, but they are arranged completely differently every time you play. 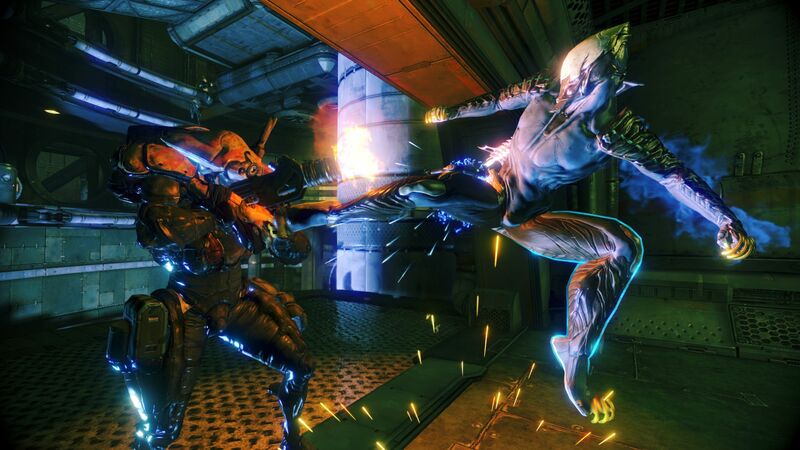 It’s a great idea and it keeps things relatively fresh on your fortieth or fiftieth Rescue run, but Digital Extremes has also promised to continually add new tilesets and designs to broaden the gameplay. My very favourite match types are Defence and Survival. These task you with holding out against an endless tide of enemies, gradually increasing in difficulty as time wears on. But the rewards are worth the risk; the longer you can hold out before retreating, the rarer and more valuable the loot you’ll receive. And as any MMO gamer will tell you, the loot is where it’s at. Defeating enemies and completing matches with reward you with components and blueprints (blueprints can also be purchased in the game’s marketplace), which can be used to construct new Warframes, weapons, accessories and equipment. If you’re lazy and have money, most of it can also be purchased with Platinum, which is derived from real currency – this is how the game itself remains free-to-play, of course. I never spend real money on something I could legitimately earn in-game, but I did chuck in a couple of bucks to get some new colour palettes (because my Mag could only be improved with the addition of hot pink) and some extra equipment slots. There’s an odd sense of accomplishment that comes from the process – finding the blueprints for the various pieces of that Warframe you want, waiting for them to finish constructing over twelve hours (yes, these things take time) and then waiting another three days for the whole thing to come together. And then, you got yourself a mechanical ninja suit there, friend. The only thing I’d rather be wearing is a cat onesie, as you know. And these Warframes are legitimate ninjas, by the way. They don’t just carry skuriken on occasion, but also run along walls, back flip, vault over things and leap soundlessly over enormous distances. And they have a strict moral code apparently, but don’t worry, it doesn’t exclude dismembering someone with molten shrapnel. They’re very clear on that. While the matches are relatively straightforward in structure, the real customisability comes from the gear you choose to take in with you. Yes you picked that magnetised longbow that impales robots to walls, but what mods are you going to attach to it? Will you make it draw faster? Will it apply an electrical stun, fire damage, or both? (The two together, incidentally, become Radiation damage, which drives enemies into fits of insanity.) Mods are like trading cards you collect, swap, improve and apply in different configurations to create the play style you like, whether it’s the stealthy approach with bows and knives, or the less stealthy approach with sticky grenades and a submachine gun. There’s even more on the MMO side, including world (or you might say, galactic) events, infestation outbreaks to contain and invasions to repel, but in summary, this is a game whose depth is not entirely visible at first glance. If you’re someone who likes to customise their character and equipment, try different play styles and jump quickly into co-operative matches with friends, this is the sort of experience you’ll find in Warframe provided you have the patience to peel away its layers. The game runs flawlessly on my PC at a constant 60 FPS (I can’t make any comment on the PS4 version, though I’m told it’s similarly polished), and the whole thing starts up astonishingly quickly from your desktop – it takes only a moment to jump into the menu and then into a match. And there’s cross-platform support! Playstation and PC gamers alike can play with each other, which makes it far easier to co-ordinate with your friends regardless of their console of choice. This is, however, a game that has the potential to get a little grindy, as with any other MMO. But the social experience and the near-constant updates and additions will hopefully keep it fresh. I certainly don’t think I’ll maintain this frequency of play for much longer (famous last words), but I like the idea that this is a game I can easily jump into for brief periods here and there if I so choose. Even Snorlax downloaded Warframe. 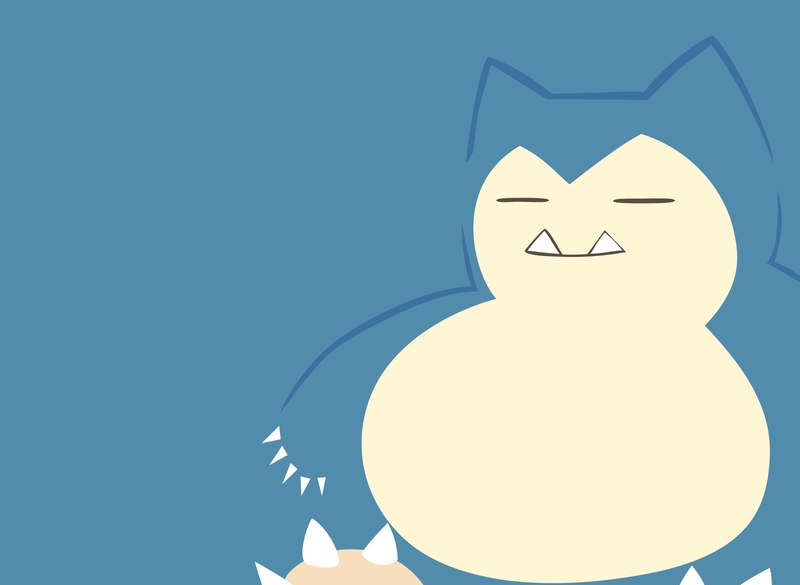 And you can’t possibly be lazier than Snorlax. EDIT: Okay, so I misread the achievement. Apparently I’ve played about forty-eight hours’ worth of Warframe, not a hundred. But still… wow. Hugh, I have been calculating how you could fit in 100 hours play time plus your full time job and general life into one week and it was blowing my mind. With work and gameplay out, you literally had 30 hours with which to sleep, drive to and from work, eat and shower. Which meant for the entire week you would have only slept less than 2 hours per night. And then you had the stamina to write this post! ‘Normal’ is a comparative term, haha. I really enjoyed Wireframe. I play it often on the PC. I just downloaded it for the PS4 and It plays surprisingly smooth.